Want just say hello from Portland, OR. Quick Ember update: Nathan will be delivering the pipes and housing tomorrow, Trevor will be perfecting the fritted glass disc screen this week, and we'll be sending all the pre-orders out within two weeks. We've sent a few out to reviewers and they all enjoy the experience and the taste. There is a sense of throwback--passing the pipe around--combined with the full flavor and effect of flower vaping, not to mention watching the flower as it releases all the magic. We're really excited about getting these out to everyone that's pre-ordered. The February pre-order discount is $35 (code FEBEMBER). It'll run out when we send the first batch out. I haven't heard back from him. One is ready with his name on it. 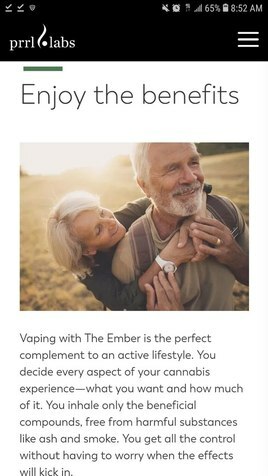 As you now have a forum presence I wanted to ask a question about The Ember. I would love to know what material the coil or heater is made from, is it stainless steel or maybe kanthol ? and do they glow all the time while in use ? Please pm me info and i’ll discuss with Bud. I haven’t seen your msg to him. It may have gotten lost in the pages. He’s gotten very inundated lately with PMs and emails and it was getting hard to keep up and keep track. We’ve got a new system now for addressing all that and its been working out nicely (so far). Yes send one to Bud ! One to Baron23 too ! We all know he runs the show ! possible to use your nice vape thru waterpipe? is there just this little wooden pipe or can i use it also with glass bowl? The wire is from jet engines. It doesn't off-gas or degrade at all. Mark, the brains behind the operation, the former aerospace engineer, sourced the wire. It is a bit of a pain to work with because it is really stiff, but that is the trade-off in using something that is totally safe. And they do glow the whole time in use. Is this future Bud and Hazel? Cool thanks for the answers there. It looks like an interesting product and I know a few users on IG who like it. I hate those "glowing golden years" pictures. You know...for the over 55 community advertisement. White haired couple in tennis outfit just radiating health and vitality. Great question. We are able to use it with pretty much anything that has a good seal. Mike, of Mike's Vaporizer Review, filmed a solid draw with a bong. We are also designing a silicone attachment to fit on the glass chimney that will then couple with just about anything. We used a rough prototype of the silicone on an old tobacco pipe, and it was great. In addition to the silicone attachment, we also have a concentrate accessory (currently called the Dabbler) that fits right into any standard 14.4 rig. What material is the wire? I too noticed that sly dodge of the question. "Jet Engine Wire" sounds like they're really trying to stretch the ingenuity of this product. jet engine wire???? thats not a good answer. we want to know the material.........is it alloy? whats inside? I'll get the details of the wire shortly. My partner is the brains of the operation. Hell get me the details. It’s a self-tempering super alloy used in rocket engines and other applications requiring strength at high heat. After the first firing, an oxidation layer forms. As far as we’ve been able to determine, there is no further degradation of the wire through subsequent thermal cycles...and so it is not releasing any oxides into the vapor pathway. steel alloy or titanium alloy? A quick search and found this as a possibility "This self -tempered low carbon epsilon-free martensite." I 2nd this @VapeCritic. Would love to hear what you think! I too would like to know what alloy you guys are using. Avoiding the materials used, makes you look shady :D Like you have something to hide. -Im sure you just protecting your product. Also I see you are making a silicon ring to make it multi-use. Will you make an ALL glass bowl with a 14/18 ground connector so your device can be universaly used with out adding more materal to air parth ect?